Grasscycling is simple. It means you leave your grass cuttings on your lawn instead of picking them up and bagging them. That’s right, you save time and labor and leave the grass cuttings behind. This is an old method that is growing in popularity due to green initiatives. Why grasscycling? Grass cuttings are a tremendous free fertilizer and when they are mulched into smaller material they can break down quickly and give nutrients back to your existing grass. 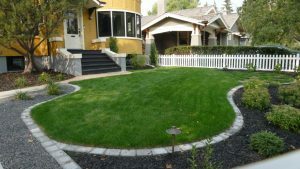 This is the ultimate way to keep your lawn healthy in an organic with with no pesticides or fertilizers. It also saves trips to the land fill and saves space in your recycling bin. To cut the grass into a finer material you will need a mulching blade attachment on your mower. The mulching blade finely cuts the grass into small pieces. Grass cycling is a wonderful way to recycle your grass and reduce your use of plastic bags. Feeding your grass with nutrient-rich grass cuttings is a great way to get a lush healthy looking lawn. Remember to cut your grass when it is not a hot part of the day as the direct sun will harm the freshly cut grass. As well, be sure to change the mowing direction you cut, each time you mow, and always leave your lawn three inches high by never cutting too short.